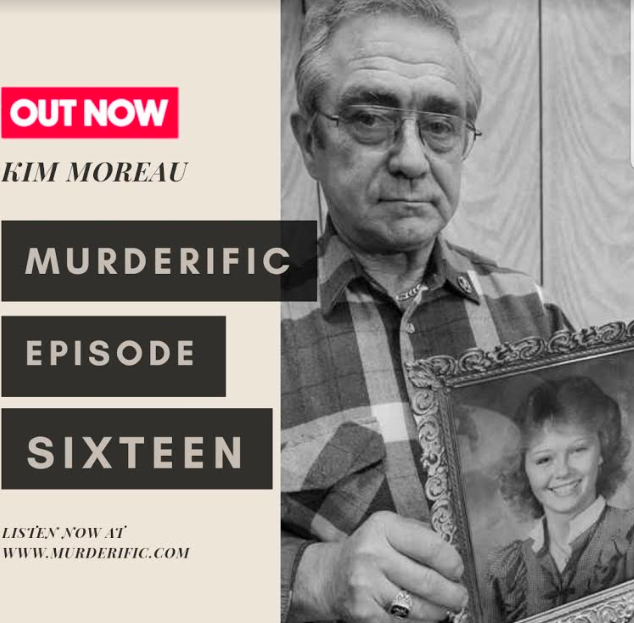 The cover for Bernadette Pelletier-Couture's podcast, Murderific, shows Richard Moreau holding a picture of his missing daughter. WILTON - Franklin County residents are well accustomed to seeing her picture- the grayscale face, pretty and young and haloed by a typical 80's hairdo- staring from telephone poles and community bulletin boards. Every so often the weather-worn picture is replaced by a new one, duct-taped to its post. 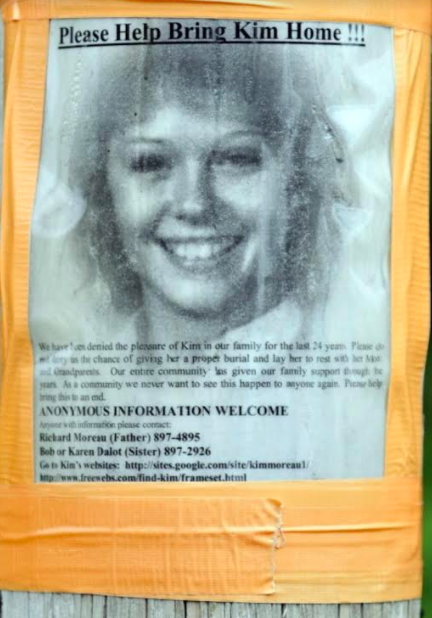 Kimberly Moreau has been missing since 1986 and her father, Richard, has never stopped replacing the poster with his young daughter's face on it. "He is never going to give up. It's all he thinks about," Bernadette Pelletier-Couture said. Pelletier-Couture is the author of a tri-weekly true crime podcast called Murderific. The Lisbon resident researches and writes all of her shows before sharing the draft with a guest to add their own research. "It's so much work. It takes up every second of my free time," she said. She started Murderific last April, born from an interest in crime and a curiosity about the world of podcasts. Pelletier-Couture tries to find stories that haven't seen much spotlight and from there she begins to research. The research, she said, is the most time consuming. "I just wanted to try it for fun and now it's an obsession. It's been getting more and more followers, so I can't stop now," she said. Pelletier-Couture's Kimberly Moreau story just reached more than 20,000 downloads. The locally-famous story has caught the interest of listeners, intrigued by the details of the poster they've always seen. Kimberly Moreau is one of the oldest cold cases in the state. The investigation is still active after 32 years, although Kimberly was officially declared dead in 1993 according to Pelletier-Couture's podcast. She was last seen on Main Street in Jay on the night of May 10, 1986. "The [Maine State] police say it's still a very active investigation. Which is all because of her father's determination," Pelletier-Couture said. The case still gets numerous tips even after all these years. If you have any information regarding Kimberly Moreau's whereabouts, please contact the Maine State Police Missing Persons Unit at 1-207-743-8282 or 1-800-THE-LOST. For a full list of Murderific podcasts click here. The familiar poster seen across Franklin County with the face of 17-year-old Kimberly Moreau. We will never forget ....there is a website up for kim..one day the truth witll come. Our heartfelt love goes out to Kims family and friends. So sad I remember this living in a small northern town in Maine.. I'm hoping someone will finally come forward, and give her poor Father some closure. It's been way to long!! Someone out there know's!! And it's time to bring it out. How would you feel if it were your loved one?? I'm sure you would want closure as well. Think of your own Parents and how they would feel!! It's sad enough to loose someone close to you. But, to not know what happened, and where they are, tug's at your heart string's until you die!!! Please stand up, and do the right thing!! Continued prayers for her Dad, Family and friends. I remember seeing posters and hearing of the news when I was a child. Now that I have children, I can only imagine how Kimberly's Dad must feel. My heart goes out to him. I only hope he gets closure. Kim’s Mom went to her grave not knowing what happened to her daughter. Don’t let that happen with her Dad.